Last year, on Juneteenth, I kneeled in front of Harriet Tubman’s grave and exhaled a simple thank you. It was an almost impossible utterance: I wasn’t prepared to contend with the wash of emotion that consumed me in that moment. A couple of weeks earlier, I sent a series of frantic text messages to a good friend, imploring her to accompany me on my drive from Brooklyn to Auburn, New York, as I wanted to finally pay my respects. Never mind the fact that Harriet has been dead for more than a century. We rented a blue Volkswagen Beetle and departed for upstate New York at 7 a.m. that Monday morning. In the days leading up to the trip, I was filled with a type of excitement and a feeling that I now recognize as slight trepidation. You see, I have been celebrating Juneteenth for as long as I can remember. I am nothing if not a Black Southern woman, the daughter of Black Southern parents, kin to folks who, despite their sojourns, always seem to land back home, back South. I have been celebrating Harriet for as long as I can remember; ages ago, my father gifted me a children’s book which provides a strikingly accurate account of her life. I still have that book. Despite having lived in New York for so long, it had admittedly never occurred to me to visit the city of Auburn, Harriet’s final resting place, until last summer. This is not because I do not actively think about how her life and influence loom over me. Rather, it was another step in my re-learning what it means to be in communion with ancestors — and this has meant renegotiating what intimacy looks like within the context of those relationships. I am deliberate in my use of the word relationships here as I contend with the epic presence of Blackness in the United States. It might also be appropriate to use the word enduring, as in the enduring presence of Blackness in this (stolen) land, as in we are still here — which is due, in part, to the work of people like Harriet, and to the consequences of that work. So, I found myself kneeling at her grave in the middle of a rainy afternoon, trying to communicate gratitude in a quiet moment. But perhaps what I was really trying to express was some type of love that has come to me across time. I want to say, using this clunky anecdote, that I am not alone in my utterances. That so many of us find ourselves kneeling before our ancestors in one way or another. Harriet is just my example. That we have inherited, in the case of Harriet, an archive wide and deep in scope, and thus a framework through which we might understand her radical life, is more than apparent. But what does it mean to understand an utterance of love through the act of archival excavation? How do we enter into communion with our people whose presences remain whole despite cradling information about their lives that may be incomplete? Those who are known and unknown. I want to say then that to contend with our enduring presence(s) here, we must reckon with the frames that come to us intact as well as the (narrative) ruptures. Art, to be certain, is a site for that negotiation. Consider the inquiries of artist Tiona Nekkia McClodden whose practice in many ways meditates on sites of absences—familial and non-familial—as sites of possibilities for contending with intersubjectivity and the enduringness of Black folks that I name above. Consider her recently curated two-pronged exhibition, A Recollection. Predicated. 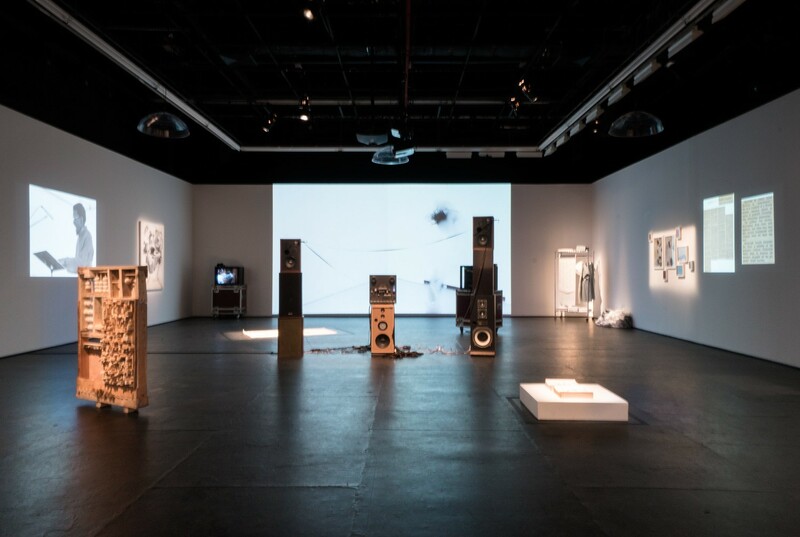 Organized as part of the larger project Julius Eastman: That Which Is Fundamental, which revives and remarks upon the creative legacy of composer Julius Eastman, McClodden’s show is now on view at The Kitchen in its second manifestation. A pianist, vocalist, and choreographer, Eastman was a central figure in the New York experimental music and art scene during the 1970s and ’80s. His music was both wildly innovative in its formal elements and uncompromising in its articulation of a gay, Black presence. Yet by the time Eastman died in 1990, many of his scores and recordings had been lost or were scattered amongst several friends and loved ones, resulting in a fractured archive. A Recollection brings together a web of Julius’s recordings, news clippings, photos, and scores as a historical act of remembrance by intentionally emphasizing the scatteredness of this ephemera. For Predicated, McClodden has invited fourteen contemporary artists—Ash Arder, Beau Rhee, Carolyn Lazard, Chloë Bass, Courtney Bryan, James Maurelle, Jonathan Gardenhire, Kameelah Janan Rasheed, Raúl Romero, shawné michaelain holloway, Sondra Perry, Texas Isaiah, Wayson Jones, and Yulan Grant—to meet Julius in dialogue around concerns of legibility, experimentation, presence, and non-presence as they might manifest themselves formally and conceptually. Because they occupy the same space, you encounter a work like Courtney Bryan’s 2013 Shedding Skin for Orchestra composition score which explores the sonic translation between jazz improvisation and classical orchestral performance alongside, for example, Julius’s final concert at The Kitchen, his 1982 Improvisations on Piano. Last summer, shortly after returning from Auburn, I visited with Kameelah Janan Rasheed, whose Unto Itself (Activation III)—a sprawling installation of inkjet prints, xerox copies, and text—forms a non-linear statement as you enter the gallery. During that visit, we spent most of our time talking about how absence is central to this notion of the epic of Black Americana. Rasheed referred to these absences as “glitches” and the term is not, as one might assume, pejorative. Indeed, in Rasheed’s own practice, the glitch is not a marker of deficiency but rather a way to grapple with our histories. To understand how Black folks are still here requires rigor and slowness and is itself a sprawling map that contains time and that which exists beyond time. I want to say then that to grapple with Blackness is to grapple with our glitches, the subtexts and tensions of these glitches as we narrate ourselves. Isn’t that how you love someone? Surely, we must ask ourselves: whose archives are allowed to be whole as they move across time? Who is allowed to engage in the act of recovery? Who takes up the act of recovery? Julius’s institutional relationship with The Kitchen dates back to the early ’70s, a fact that is difficult to ignore if you pay close attention to the print ephemera that is included in the exhibition. Working closely with Gerry Eastman, Julius’ little brother and manager of The Julius Eastman Estate, and Katy Dammers from The Kitchen, McClodden has brought Julius back to the organization, which is my way of saying: I don’t know who would have done this if not this Black woman. And isn’t that what it means to love someone, too? Here is what I will linger with for a while longer: To recover and to uncover can be part of the work of cultural production, and certainly that of Black cultural production. Contained within a perceived absence or chasm is actually a moment of imagination, and the possibility of responding to this absence or chasm or glitch or fragment—of kneeling that is—with love, in love.